The Lavina 25-X series is a great addition to your concrete floor polishing machine. This floor polishing machine will work with any dry or wet application and is perfect for prep, polishing and floor maintenance. Other features include a floating head that is compatible with Calibra QuickChange tools. An additional safety feature of the Lavina 25 concrete floor polisher is the new security plate locks that will prevent a fallen head or tool from falling away from the machine while polishing. Other features include an exclusive U-Joint technology which includes an additional axis for added flexibility and maneuverability. The exclusive technology helps the base “float” in whichever direction needed. New window on the machine bases for easy access to the planetary chain. The lifting handle of the base has been upgraded for ease of operation. Features a metered water flow system, allowing for more efficient work during grinding and polishing. 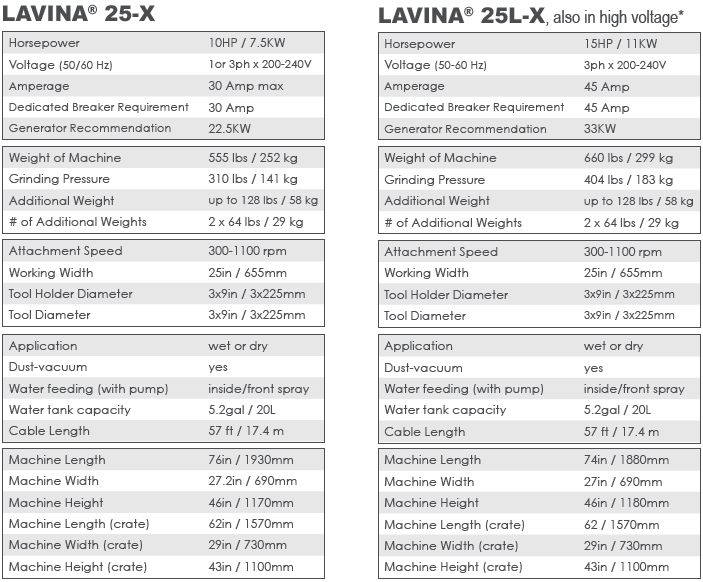 Click the button below to add the Lavina 25-X and 25L-X Grinder to your wish list.